Make sure the acetyl-l-carnitine supplement you take passed our quality review and is right for you! What is acetyl-l-carnitine? Who can benefit from it and what should you look for in an acetyl-l-carnitine E supplement? ConsumerLab.com answers these questions and more in this report. ConsumerLab.com also purchased and tested the ingredients in acetyl-l-carnitine products and rated their quality. It found that the price of comparable, high-quality products to vary enormously -- by as much as 300%! ConsumerLab.com reviewed the evidence for the use of acetyl-l-carnitine for memory and cognition in older people with age-related memory problems, Alzheimer's disease and other forms of dementia, diabetic neuropathy and neuropathy associated with antiretroviral drug therapy, fibromyalgia, androgen decline in older men, male infertility, Peyronie's disease, and fragile X syndrome. 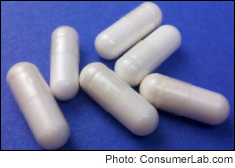 (4/5/16): Two CL members reported recently purchasing one of the Approved products in this review and noticing a problem with some of the capsules. For more details, see the Update at the top of the full report.